This happened when we first moved into the house we now live in here in Massachusetts, I was around 5 at the time. I can’t say when it started, but I had begun having a recurring nightmare that centered around my closet being some sort of portal. The door would open up and from this blue light, a set of twins would walk out holding hands, one boy one girl, and every time they asked the same thing. 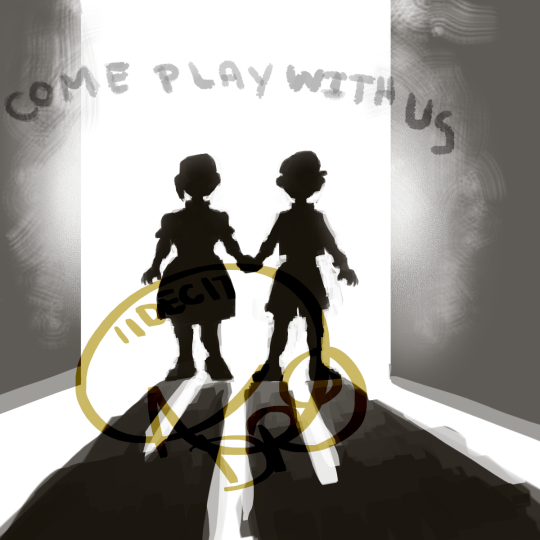 “Come play with us.” to which I declined, resulting in “Next time” and the door closing behind them. Now if that wasn’t terrifying enough there were instances where I would leave my room knowing the closet door was shut, and return with it open to which I would immediately run out of the room. I thought for a while it might have been the wind, but it stopped happening about the same time the dreams did. For the next ten years I always had something in front of the door to make sure it wouldn’t open. FYNK James: 7/10 This one’s unique in a super spooky way. Thanks for sharing the scares! Got inspired by the above story to draw this picture.